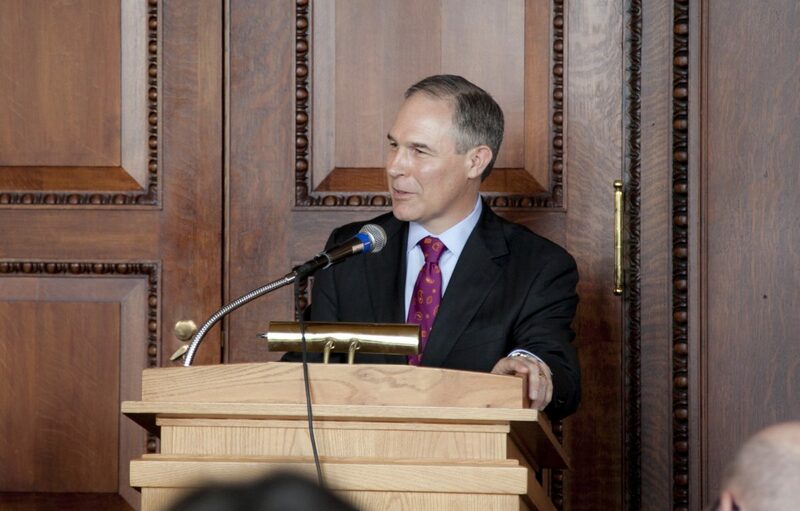 The Burton Awards program, run in association with the Library of Congress, had Oklahoma Attorney General, E. Scott Pruitt, chair of the Republican Attorneys General Association, as the guest speaker at the Burton Awards luncheon, held on June 9, 2014. The luncheon was held in honor of the finest general counsels in America who have been named “Legends in Law.” This year marks the fifteenth anniversary of the non-profit program. Attorney General Pruitt was elected in 2010 and currently serves as chairman of the Republican Attorneys General Association (RAGA) as well as chairman of the Midwest Region of the National Association of Attorneys General (NAAG). As a first priority in office, Attorney General Pruitt established Oklahoma’s first Federalism Unit in the Office of Solicitor General to more effectively combat unwarranted regulation and systematic overreach by federal agencies, boards and offices. Prior to serving as Attorney General, Mr. Pruitt served Broken Arrow, Coweta and Tulsa in the Oklahoma State Senate for eight years, four of which were served as Assistant Republican Floor Leader. Attorney General Pruitt grew up in Lexington, Kentucky. He went on to earn a bachelor’s degree in communications and political science at Georgetown University before being accepted to the University of Tulsa College of Law. The Attorney General and his wife of 22 years, Marlyn, are raising two children, McKenna and Cade, in Tulsa.